Well, hello! Welcome to 2018. I didn't post a single thing here in 2017, for reasons like LIFE and WORK and also SLEEP and SLOTH. Those four categories pretty much cover it, and rather than dwell, let's look forward instead. Specifically, let's look forward to February 13, 2018, which is when Stillwater General #2 hits shelves both physical and electronic. "Stillwater Gen #2?!?" you are probably saying right about now. Yes. Frankie (and her family) (and the rest of Stillwater) (especially Noah) have another book coming in one month. The title is NO ONE CAN KNOW, which I love, because it sounds ominous and secretive (ACCURATE). The problem, of course, is that every time I talk about it, the conversation goes like this. "When's your next book out?" "I can't wait! What's it called?" "But...why not? I really want to know." "No. NO ONE CAN KNOW. That's the title." Three months. That’s how long ER nurse Frankie Stapleton has agreed to stay in her sleepy little hometown of Stillwater, helping her estranged sister save the family hardware store, working a few shifts at the local hospital, and most importantly, rebuilding the bridges she burned on her way out of town twelve years ago. When a pregnant car crash victim arrives at Stillwater General, Frankie and the team race to save both mother and child―but only the baby lives. Rumors swirl that the accident was deliberate, and Frankie’s horrified to realize that she let the driver escape. But why would anyone want to kill Kate Tibbs, a social worker and the wife of an up-and-coming local politician? Frankie’s investigation turns up plenty of motives, from revenge to dirty politics, and even more suspects. There are secrets in Stillwater, and she's determined to uncover them, even if it means involving her loved ones for help. But when the baby disappears, her search for the truth becomes a desperate, deadly race against the clock. No matter the cost, Frankie must piece together the truth to stop a killer and save a tiny life in Lucy Kerr’s riveting second Stillwater General Mystery, NO ONE CAN KNOW. 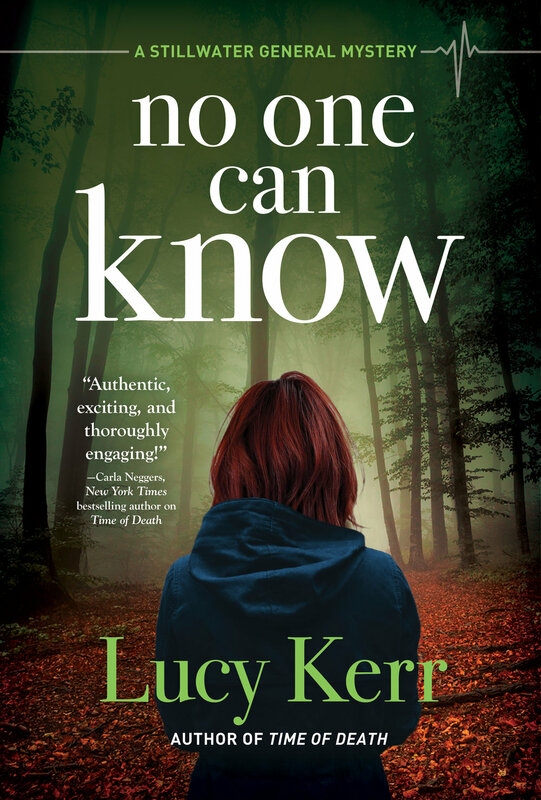 You can pre-order a copy here, if you like, but if you're in the Chicagoland area, you can also join us at the NO ONE CAN KNOW launch party at my beloved local indie bookseller, The Book Stall. I'll have more information about the book, including giveaways and other events, very soon. In the meantime, feel free to spread the word about NO ONE CAN KNOW. It's like Who's On First, only more murder-y. If you've already subscribed to my newsletter, THANK YOU! And here's the recipe I promised! If you haven't subscribed, click here to get a monthly note from me, filled with bookish news and ramblings about things I love. This month's newsletter has a few of my recent obsessions, and one of them is a seasonal recipe that is very popular at Casa O'Rourke: Apple Cider Syrup. It's incredibly easy to make, keeps forever in the fridge, tastes delicious with a million things, and makes a great hostess gift. Anything that needs a hit of sweet-tart autumnal goodness is a candidate for cider syrup. Ready for the recipe? Take one gallon of cider. Boil until it's as syrupy as you want. Pour into a jar. Enjoy. It is seriously that easy, which is mind-boggling to me. If you'd like a bit more direction, though, here are my amateur photography efforts. Get a heavy pot. I got mine for 30 bucks at Target years ago -- this is the closest I can find now. No idea if the quality is similar, but mine is a total workhorse and it looks SO HAPPY sitting on my stove. ...pay more attention. You're getting close. Stir. Scrape down the sides, if you want. Soon it will start clinging to the back of the spoon, but still seem thin, and you'll get bored, and want to wander off. DON'T. You're almost there! Suddenly it will be amber-colored and the consistency of maple syrup. You can keep reducing, if you want it to be thicker, but that's a matter of personal preference. Just remember that you're storing it in the fridge, and cold syrup takes longer to pour. Use a funnel to pour it into the jar or bottle of your choice. It's hot, so be careful. I ended up with two half-pint mason jars (one for a dear friend) plus a smidge extra that I served with dinner that night. Eat on whatever you think could use a little boost. It tastes like autumn, only concentrated. Popping in quickly to say that if you don't already subscribe to my newsletter, you should! At most once a month, I send a quick missive to your email, full of bookish news and a rundown of things I am currently obsessed with: books, recipes, Target finds...whatever is taking over my brain that month. Best of all, there's usually a little something for you, too -- a behind-the-scenes look, an exclusive reveal, or a giveaway. This month, I'm giving away an advanced copy of Time of Death, and all you have to do is subscribe to the newsletter. (Click here.) Reminder: after you click subscribe, you'll get an email asking to confirm your interest. If you don't confirm, you aren't subscribed -- and that means you're not eligible to win, which would be a TERRIBLE THING. So...click confirm! And if you're already subscribed, no worries! I'll be picking randomly, so you've got an equal chance to win. I'll be picking the winner at noon on Monday, so make sure you're signed up before then. Go forth and subscribe, my lovelies! Last summer, my beloved agent Joanna asked if I would like to try my hand at writing a mystery. It took me all of thirty seconds to respond, “YES. YES I WOULD!” I turned off the internet, retreated into my writing bunker, and began to figure out whodunit – and more importantly, who solved it. The answer to the latter was a snarky, commitment-phobic ER nurse whose family relationships were strained, to say the least. A woman who was good in a crisis, but less adept at managing daily life. A woman who fled her hometown for excellent reasons, and returned home for even better ones. TIME OF DEATH, a Stillwater General Mystery, will be published by Crooked Lane Books on December 13, 2016. Yes, that’s THIS December. Yes, it would make an excellent Festivus gift. Yes, I’ll have more details forthwith. But here’s the second part of the secret. Erica O’Rourke didn’t write Time of Death. Now, Lucy looks…a lot like me. She talks a lot like me. She is equally fond of coffee, books, and pajama pants. Here’s the difference: Erica writes young adult books with magic and scifi. Lucy writes adult mysteries. Different genres, different names-- but still, at their heart, stories about strong ladies making things right for the people they love. The news will be a mix of Erica’s stuff and Lucy’s stuff, and probably a lot of talk about pajama pants and cookies. And now, it’s time to celebrate! Welcome, Lucy!